I am always looking for new and exciting ways to practice sight words with J. 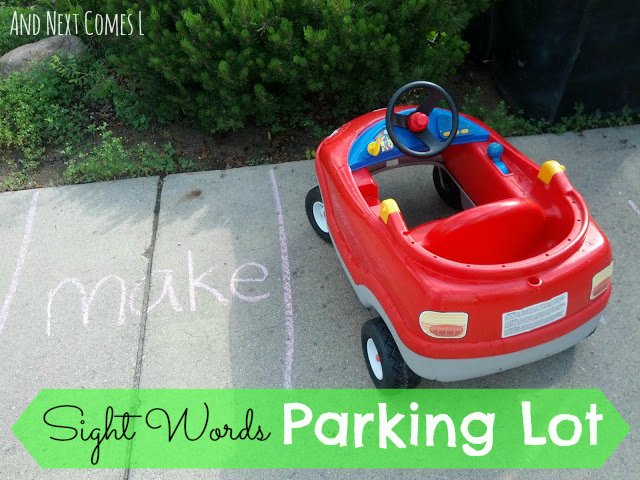 So when I saw this Sight Word Parking Lot activity from Juggling With Kids (Seriously, check it out, but come back here, OK? ), I just knew I had to try it out, with my own spin on it, of course! We took it outdoors and did it on a much larger scale! The weather has been so nice lately; actually it's been verging on too hot most days. 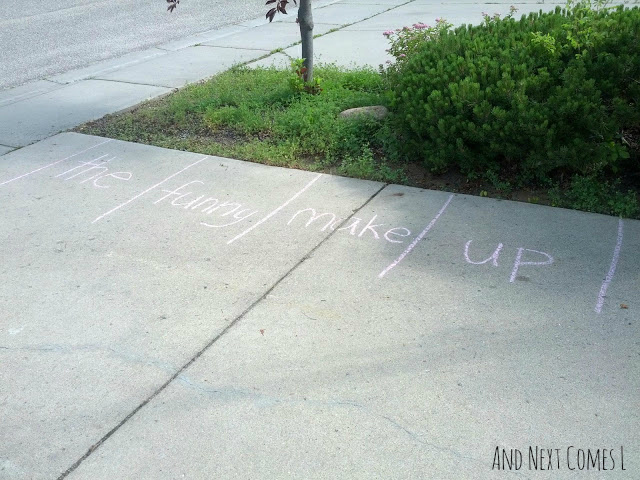 So to take advantage of the beautiful weather one morning, we headed outside to do this activity. 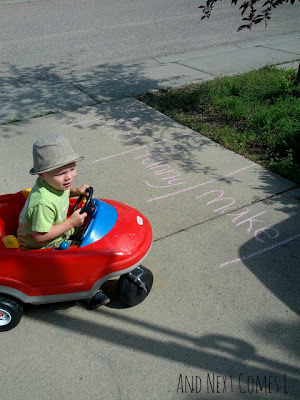 Using chalk, I drew parking spots on the driveway. In each parking spot, I wrote one sight word. I picked them randomly from this list. Luckily, one day a few weeks ago, the neighbors behind us gave us a ride on car (for free!) since their kids had outgrown it. It was the perfect car to use for this activity. However, a tricycle or bike would work just as well. Then it was time to do the activity. If I had blinked, I would have missed J doing it. He just drove around, without parking in the parking spots, reading all the words. Took him like 15 seconds and then he was done. Turns out he just wanted to write his own words with the chalk. Regardless, he got his sight word practice in and then moved on so it wasn't a complete fail. If your kids aren't reading yet, you could always do an alphabet parking lot. K happily participated by parking in each spot and reading the letters that he saw. Looking for more sight words activities? Check out our Sight Word Popsicle Stick Puzzles or Sight Word Matching Pole. This is a wonderful way to work on sight words. I will be sharing it on Facebook with my readers. Thank you for stopping by and for sharing. I appreciate it! 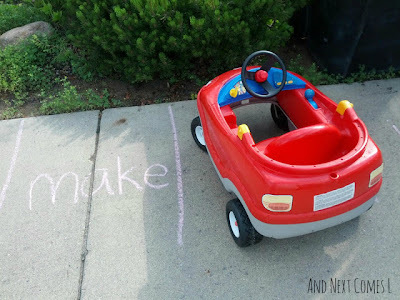 Love this idea --- and having a big car in our garage just waiting for some fun... Definitely got to do this! Such a great idea! Makes me wish we hadn't just gotten rid of the little car we had! Grr! You could use a bicycle instead, Emma.